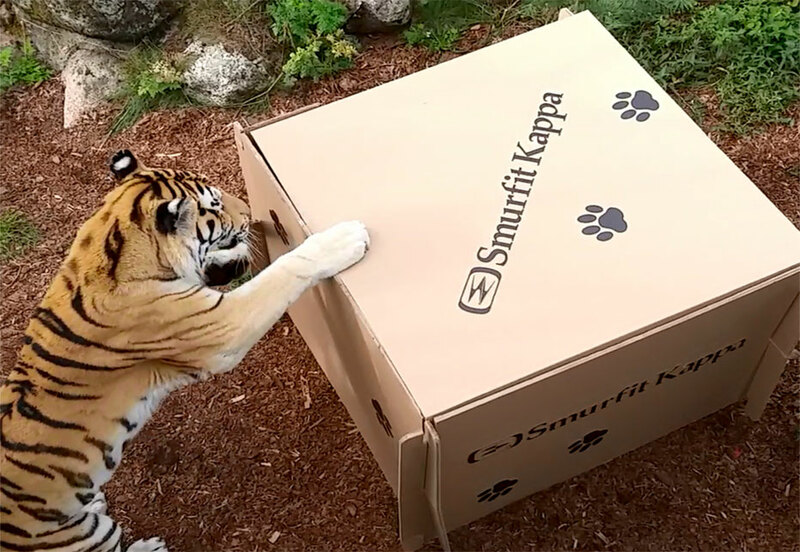 Smurfit Kappa has created a new range of corrugated toys for the lions and tigers in a Polish zoo. The packaging leader was approached by a zoo in the Polish town of Człuchówz with a special request for the big cats. Alicja Mackiewicz looks after the behaviour and wellbeing of the animals in the Człuchówz zoo. Speaking about the toys she said: “Cats, as everyone knows, love cartons and lions and tigers are no exception apart from needing much larger boxes of course. Smurfit Kappa provided exactly the right thing and most of all they were perfectly safe. Jakub Świętek Innovation & Development Manager, Smurfit Kappa Poland, added: “In the past we created a corrugated ‘cat carrier’ which went on to win a Red Dot Design Award but this was the first line of products we created for big cats. Smurfit Kappa has a long history of working closely with the communities in which it operates.